UCF student Taylor Lochrane gave President Barack Obama a demonstration of his cutting-edge transportation technology today at a federal highway research center in Virginia. Lochrane, who has two UCF engineering degrees and is on track to earn a Ph.D. this fall, showed President Obama a vehicle he customized with special sensors and how the technology could make highways less congested and safer to travel. Obama highlighted the technology during the first few minutes of his speech. 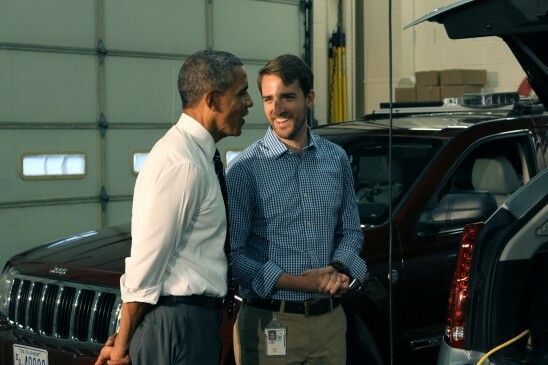 Lochrane is a research civil engineer at Turner-Fairbank Highway Research Center, where Obama spent a few hours testing a driving simulator and learning about connected vehicles. Lochrane demonstrated the technology that supports one of the center’s active projects on Speed Harmonization, a method to reduce congestion where lanes merge and form bottlenecks — the greatest cause of congestion nationwide. Mobile traffic sensors send real-time conditions at a congested location to a traffic management center. A computer uses this information to calculate optimal speeds for vehicles approaching the congestion and sends the speeds to connected vehicles on the road via wireless communications. The drivers receive the recommended speeds and can adjust accordingly. Or, in an automated vehicle, the vehicle could adjust to the recommended speed automatically. Lochrane landed his job with the federal Department of Transportation research center in 2011 after earning several awards, internships and fellowships while studying transportation engineering at UCF. He speaks to his thesis advisor, Engineering Professor Haitham Al-Deek, every week to stay on track to get his Ph.D. this fall. Lochrane is no stranger to working on projects with real-life applications. While earning his master’s degree, he worked on a project with the former Expressway Authority. The project looked at the impact electronic signs on the roadway had on drivers during times of congestion. He also was the lab manager at UCF’s Center for Advanced Transportation Systems Simulation . He even customized a vehicle with special sensors for his Ph.D. work that will help him understand drivers’ behavior and how new technology may enhance mobility and safety. That is the vehicle he showed Obama on Tuesday. Lochrane is passionate about the impact research and people can make on transportation efficiency and safety. While student body vice president at UCF, he helped implement three initiatives related to transportation and student needs. He helped bring Zimride, a rideshare for students, to UCF. He also helped create a campaign to raise awareness of the dangers of distracted driving. And he helped design and launch KnightLYNX, an evening bus service that offers an alternative mode of transportation to students in the late evenings and on weekends. Lochrane says UCF gives students plenty of opportunities, but they have to be motivated enough to go after them.